I was assigned the torso section. The word corpse, has no relevance to the dead or decaying in this instance, it just makes it sound cool. 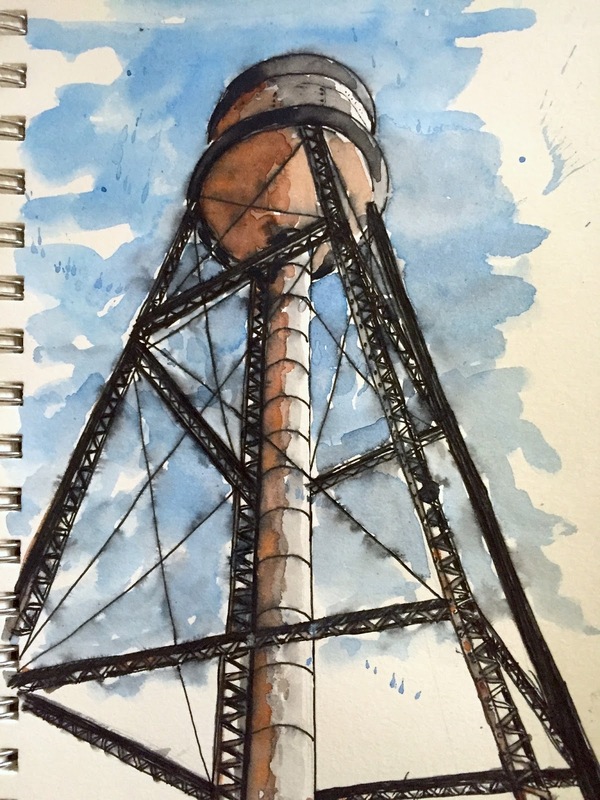 So you can draw or paint anything you want really. I have had an idea bouncing around in my head for some time. 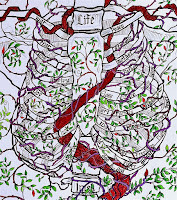 That idea is to mash up a colonial sampler, illuminated manuscript and celtic weave patterns along with old bones. So I sat down, sketched out a few ideas, did a some thumbnail drawings and finally got the ideas to settle down enough to do this work. The bones are really the scaffolding for the vines. 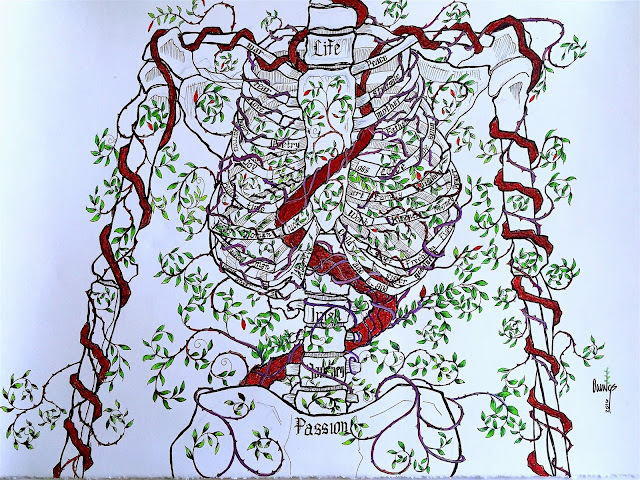 The heavy red vines represent the blood of life as it travels throughout the circulatory system and into the smaller purple vines and eventually out the green leaves. 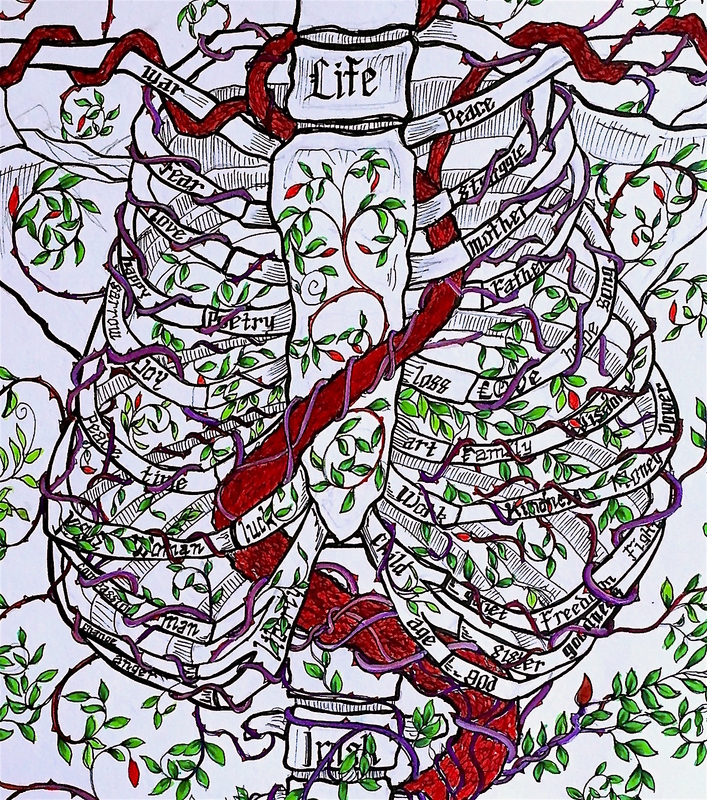 The writing on the bones represent whatever you want really. For me they are the things that occupy my mind and soul. 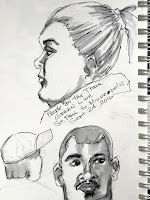 Many other Artists were asked to participate and I got a short preview of some of them when I dropped my piece off. Wet Paint will hang them up on Monday and it'll be great to see all the cool combinations. I'll post some pictures at a later date. 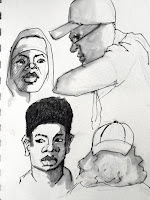 The next set of sketches of is from a recent outing that my son Ethan and I went on with the Twin Cities Urban Sketchers group. 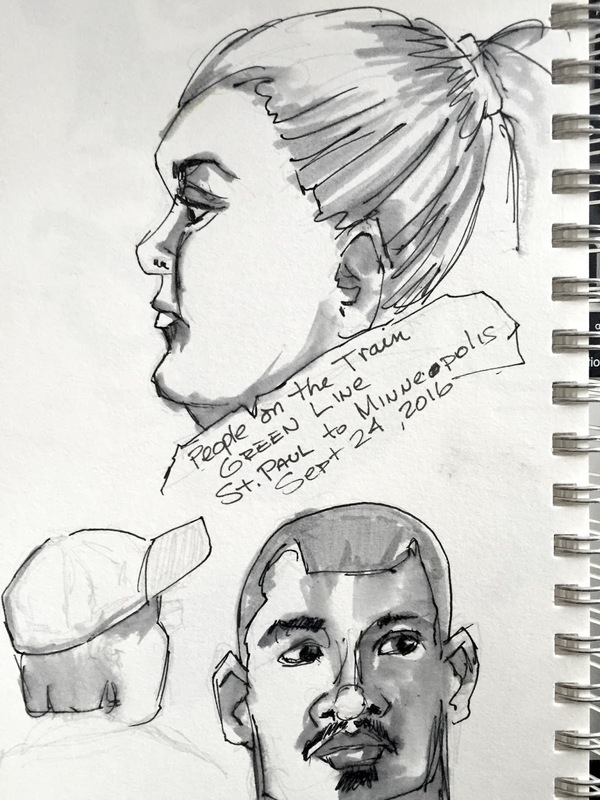 The objective was to ride the Green Line from Saint Paul to Minneapolis or from Minneapolis to Saint Paul and to sketch on the train. 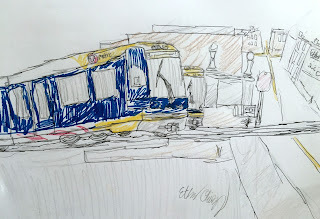 Ethan and I took the Green line beginning in Saint Paul. 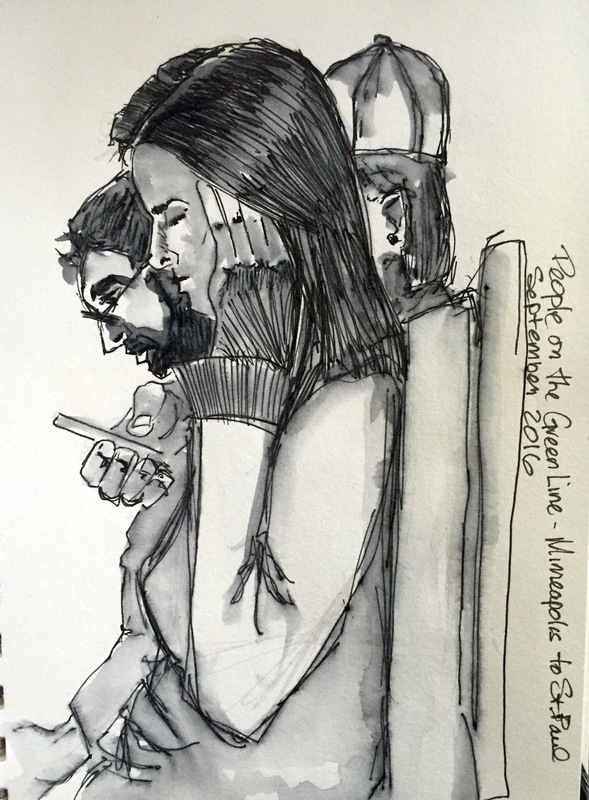 We rode all the way to the end of the line in Minneapolis and all the way back to Saint Paul. The entire ride too less than two hours, but flew by much faster. 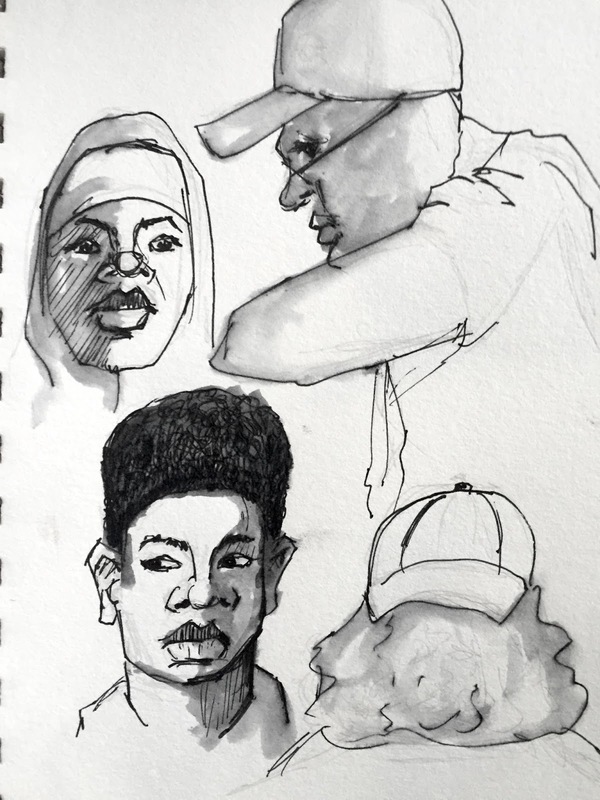 You can learn a lot about people, just by observing them and I teach Ethan about the powers of close observation and how it can help his drawings. He was more excited just to ride the train and look around at the sights and sounds. This is exactly what an eleven year old should do. 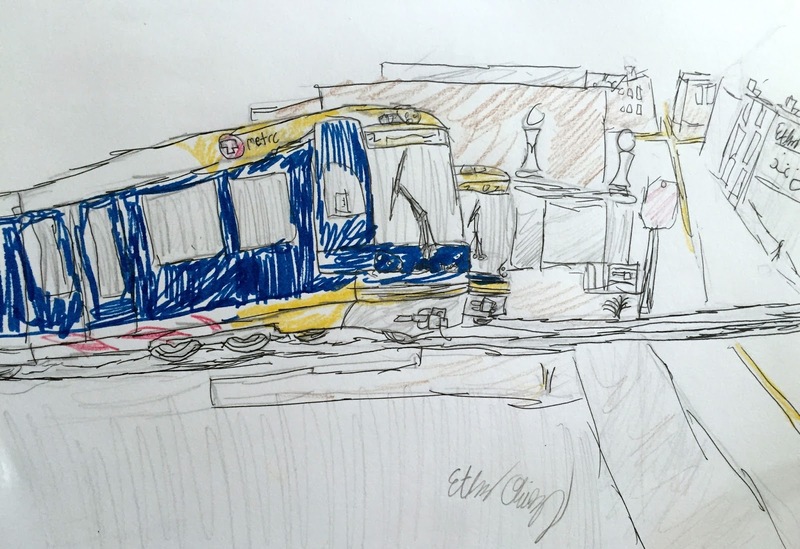 Once we got back to Saint Paul, Ethan decided to sketch the trains. 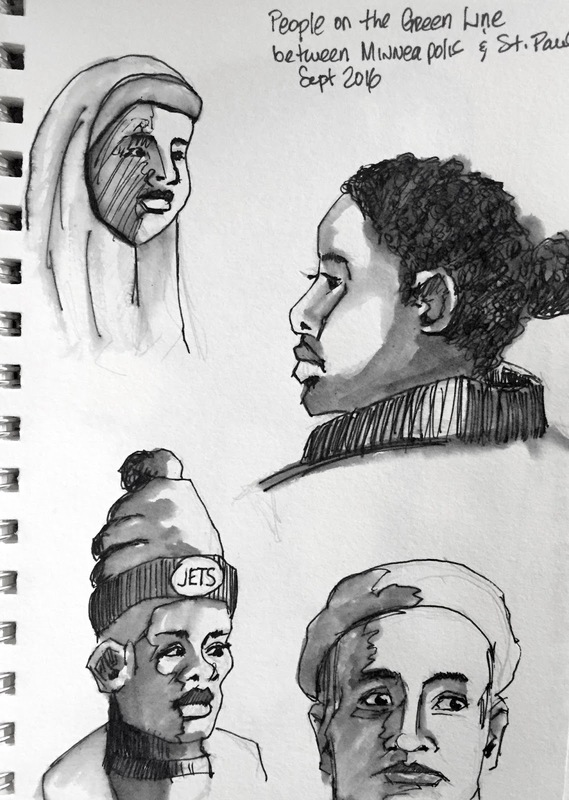 I was very excited when I saw his finished sketch, because I could see that some of what I was teaching him on the train ride, about close observation, had sunk in. He really did a nice job, in my humble opinion. The finished torso of the Exquisite Corpse.